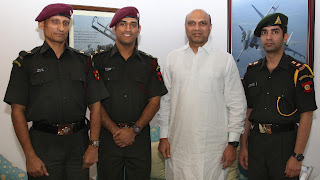 MS Dhoni, Abhinav Bindra and Dr Deepak Rao were pipped in by the Army Chief Gen VK Singh today, here. 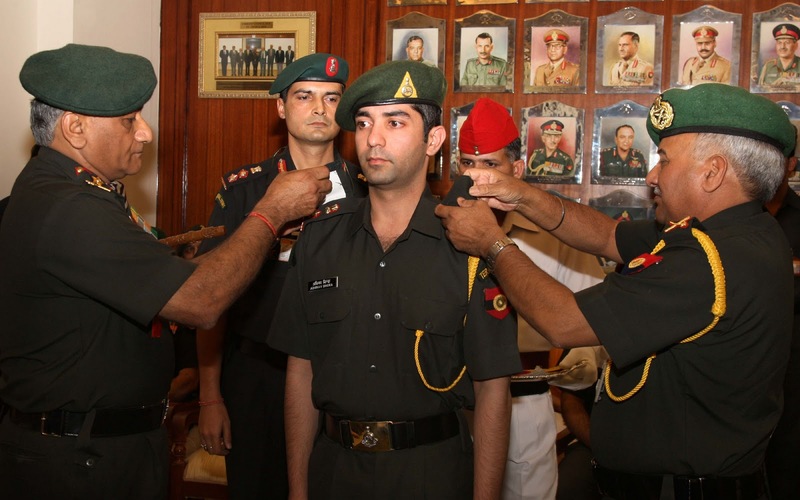 MS Dhoni and Abhinav Bindra have been commissioned as Honorary Lt Colonel and Dr Deepak Rao commissioned as a Honorary Major in the Territorial Army. MS Dhoni and Abhinav Bindra have been bestowed the honour for their outstanding contribution in the field of sports and their commitment to the Army on various occasions. MS Dhoni has set an example by his unstinted hard work, discipline and supreme dedication. His leading the team from the front, remaining ultra cool in adversities, maintaining excellent physical standards, and giving all credit to his teammates, is very synonymous to the Army way of leadership. Abhinav Bindra is youth icon and his qualities as a valiant fighter, dedication, hardwork, supreme concentration and perseverance are synonymous to an Army leader. Deepak Rao is the first Indian to specialise in modern Close Quarter Battle Training (CQB) and has imparted his expertise for 17 years to train soldiers from various Indian forces. He has also been Instructor in Reflex Shooting and Deep Sea Diving. Despite his outstanding achievements he remains committed, selfless and has dedicated his life for Army as an organisation. 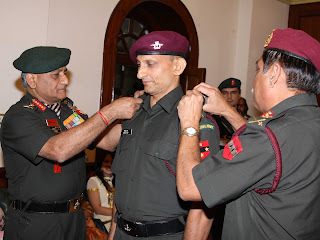 For his yeomen service to the nation and specifically providing assistance to training of the Armed Forces in Close Quarter Battle, Advanced Commando Combat System and Combating Terrorism, Dr Rao has been bestowed with the honour. All the three young honorary officers have always followed the ethos and culture of the Indian Army. By donning the Olive Greens, they will be an inspiration to many youngsters of our Nation. As Brand Ambassadors of the Indian Army, they will strengthen the citizen-soldier bonds. Col (Honorary) Anil Habbu, Lt Col (Honorary) Kapil Dev and Lt Col (Honorary) Mohanlal are the other Honorary officers of the Territorial Army.